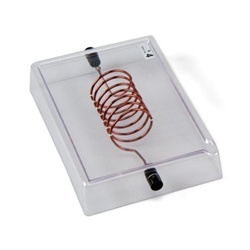 Current Conductor for demonstrating the magnetic fields of current-carrying conductors. The magnetic field can be made visible with iron powder. Acrylic glass base with two 4 mm safety sockets. For projection on the overhead projector. 250 g of iron filings for displaying magnetic field lines. In a storage flask. Use this plastic bottle to scatter iron filings that make magnetic lines of force visible.